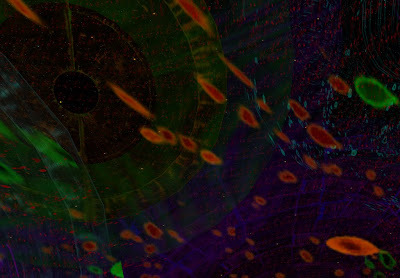 “..stepping lightly down to bathe in the rainbow-coloured spray, would have seen the identical sights that we now saw,– the great prawns gliding like transparent launches, anthea waving in the twilight its thick white waxen tentacles, and the fronds of the duke faintly streaming on the water like huge red banners in some reverted atmosphere...” wrote Philip Gosse to his son Edmund in 1907. 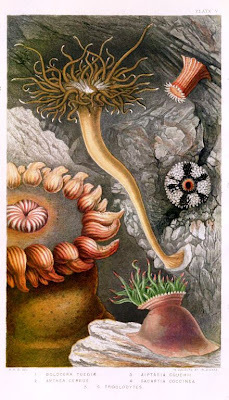 Gosse is the author of Omphalos: An Attempt to Untie the Geological Knot (published two years before Darwin’s Origin of the Species), a marine biologist and illustrator of sea creatures, anemones and corals. I was reminded of him when I stepped out of my trap with Blued Food, on a visit to VeGeTal PLaNeT, created by French artist Vroum Short. Beneath a churning sea, we moved through galleries containing natural and cybernetic forms that flared, spiked, oscillated and swirled. Short’s output is almost overwhelming. She layers animations to create unique compositions that impart a kaleidoscope of moods. Blued’s distinctive eye led us through the wild maze of panels and free standing kinetic work and settled in front of a piece called Chaos. 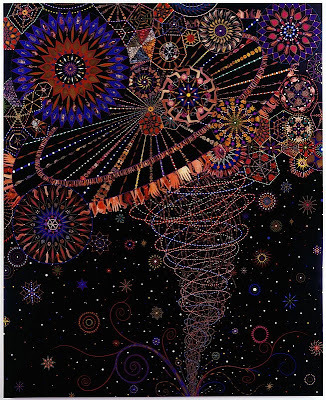 It reminded me of the artist Fred Tomaselli, who explores the relationship between art making and drug taking. His chosen materials include pharmaceuticals - prozac, aspirin, antacid, saccharin, ephedrine - plants and magazine clippings that he meticulously arranges onto glazed panels. The combined effect makes references to everything from a primitive 18th century folk quilt to a tripped out 3-dimensional universe that morphs in front of your eyes, requesting an audience with your spiritual side. Tomaselli writes, “I want people to get lost in the work. I want to seduce people into it and I want people to escape inside the world of the work.” Short accomplishes this too, especially with Chaos, inviting viewers to literally sit on pose balls, alongside its pulsing panels. I was seduced by its celestial and rhythmic patterns, and disappeared into my own galaxy. Short’s Neptunian botanical installations offer an aesthetic appreciation of nature in its most fantastical forms.